Most Watched is a collection of publications aimed to show society the advantages of living in a digital world and the roll of digital culture as a transformation factor, which brings out innovative talent and creativity from the people. Each volume analyzes actual trends related to technology and communication networks, trying to point out apparently ephemeral fashionable topics that might be the spearhead of deep social and economic changes. 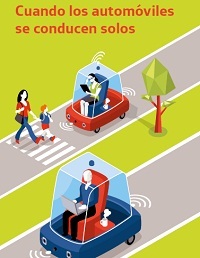 This issue tackles advances made in self-driving cars, that is cars which don´t need us humans to move around. Autonomous cars bring forward ethical and moral issues and operational challenges which must be overcome before they hit the road. Should we leave the control of means of transport to machines? Up to what point are humans needed? Will highways only transited by self-driving cars be secure?